‘All of Europe will soon unite’. Europe in Dutch Waterloo literature. Throughout the centuries, the self-image of Europe and Europeans has been subject to change, and different opinions on this matter have existed simultaneously. Nevertheless, the Battle of Waterloo has offered a communal point of reference in European consciousness for both his supporters and opponents. Waterloo rocked Europe to its foundations and it was by far the largest battle ever fought on the Low Countries’ soil. The battle immediately attained mythical status and European artists of diverse tempers, such as Victor Hugo, Willem Bilderdijk, Walter Scott and Multatuli have contributed to its remembrance. This article aims to investigate the Waterloo literature of the Low Countries from a European perspective, and to analyze the literary representation of European characters, stereotypes and self-images. This fragmented history of the Low Countries and their importance for the political stability of Western Europe presented an ideal environment in which European self-images could be expressed. Faced with the battlefield of Waterloo. The memory landscape in the perception of British, French, Prussian and Dutch travellers (1815-1870). In the aftermath of the Battle of Waterloo, the battlefield developed into a traditional destination for tourists on the continent. Up to now, nineteenth-century visits to Waterloo have mainly been analysed from the perspective of British travellers. This article will foreground the national differences in dealing with the battlefield on the basis of British, French, Prussian and Dutch travel accounts. The way tourists approached the battlefield points to a tension between a collective national perception and an individual experience of the past. Whereas the nation state was the dominant frame from which they judged their environment, visitors also looked actively for a personal, unique relationship with the past. The tangible remains of the battle were essential to their attempts to recall the battle. Learning for the Fatherland? The Battle of Waterloo in Dutch history textbooks. 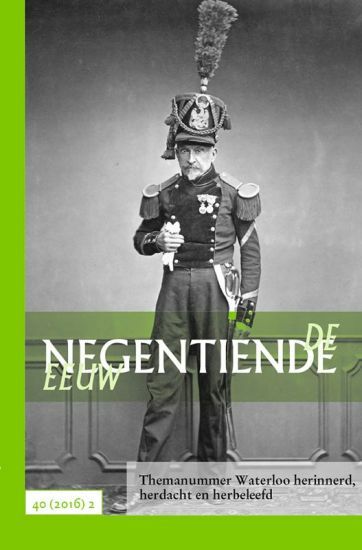 In this article we discuss how and why the Battle of Waterloo was represented in Dutch history textbooks for secondary education during the twentieth century. How many pages were devoted to the battle? Who were the protagonists? The research shows that the number of pages devoted to Waterloo decreased, a tendency which was strengthened after World War II. Particularly between 1960 and 1990 schoolbooks dismissed national and military history, including the Battle of Waterloo. Remarkably, we also noticed for the whole period an epic concentration on Napoleon, Blücher en Wellington. The schoolbooks seem to follow British historiography and hardly paid attention to crown prince William of Orange. The probable reasons for this was that the topic was often placed in a chapter about European history. Since 2000, Dutch history textbooks focus more on national history. However, the Battle of Waterloo remains a minor topic. Textbooks also ignore the diversity of the allied forces, including the military contribution of the Dutch prince. Re-enactment and reconstruction of Waterloo. In June 2015 the Battle of Waterloo was reconstructed on the site. This event was the most spectacular and most popular part of the anniversary celebrations as well as a major manifestation of the international reenactment movement. For a large audience it provided convincing evidence for both the enchantment and the contradictions of historical reconstruction and reenactment as a public performance. The strategies and instruments used to make the spectacle comprehensible for the audience as well as the presence of the public as such (the well-filled and always visible stands) undermine the historical illusion and experience. Anthropological research on re-enactment groups and the programs and testimonies of the reenactors themselves confirm the impression of the re-enactment community as a (more or less) closed and idealized community, for which ‘those outside reenactment’ are considered as uninitiated and even intruders. Occasional performance and public are necessary for the legitimacy of the activity, but the essence of reenactment lies in the experience of re-enactors themselves.